When an attack damages the target, the source can discard the target's armor. If this sword is equipped with the other twin sword, the attack range is four and each attack can target an additional person. 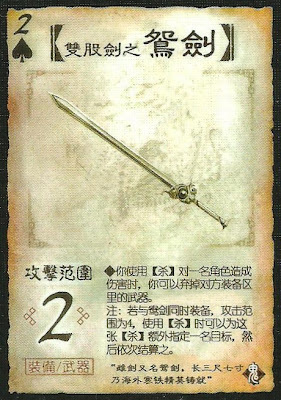 The other twin sword is the Yang Twin Sword. Both can be equipped at the same time. The function is similar to that of the Longbow.